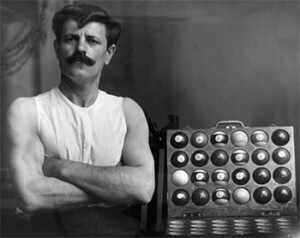 Billiards history is a bit undefined… It’s not known exactly when or where the sport originated. It’s believed that the earliest form was from France. It was a version like that of an indoor lawn game similar to croquet. The object of the game was to push a ball through a croquet-like wicket to hit a peg, similar to the stake in croquet. Players used a club-like stick, which became known as the “mace”. Billiards history tells us that during the early 19th century, American craftsmen began to make tables. Billiard tables originally had flat vertical walls for rails, and their only function was to keep the balls from falling off the table. The rails resembled river banks, and used to be called banks. When players found out that the balls would bounce off the rails, they began to deliberately aiming at the banks. That was the invention of the “bank shot”. According to billiards history, the game became associated with pool parlors in large cities. The word “pool” at the time meant gambling, but it was soon attached to the American form of pocket billiards and is still commonly known as pool. The most popular form of pool, eight ball, was invented in the early 1900’s. This was then followed by nine ball and cut throat. Three of the most common forms of the game known. It’s suspicious and unknown origin may always be a mystery to us as we continue to expand on game variations, development, technique and technology. It is a sport and a leisure that is here to stay. Even today, though we already have our standard variations of the game, we see different styles and approaches arise continuously. Professionals are always eager to take the next step and be the first to make a newly developed shot or master their own personally created technique. Billiards history is an interesting story to tell others while playing the game. Most people are not aware of it and though it’s a seemingly trivial bit of information, sharing it makes for good conversation. Try it!